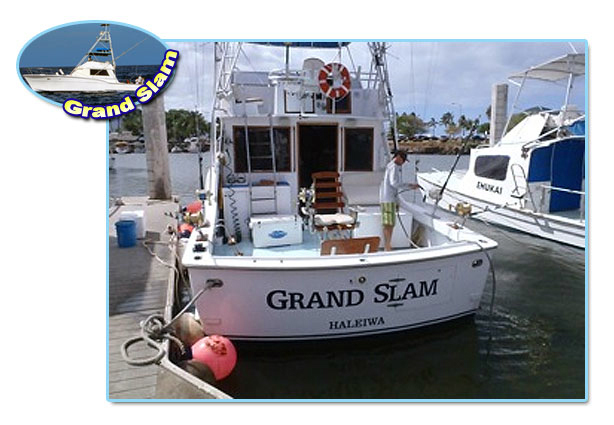 Captain Mark and the crew aboard the GRAND SLAM would like to welcome you to North Shore Sport fishing Charters. The North Shore is home to the most productive fishing grounds in all of Hawaii with year round world class deep sea fishing for record setting marlins, giant yellow fin tunas, furious mahimahi, and smoker wahoo (ono). Year after year sport fishing from Haleiwa Harbor has produced the highest percentage of catches in all of Hawaii. We gladly cut up the first 50 lbs of whole fish for our guests to take home. We fillet and package your share for each guest at the end of the day.